Thanks Bill. The largest I have landed is 22". I wish you could see some of the monsters friends of mine have pulled out. The largest I've seen pictures of were 28". My dad and I come up there every year around this time. We will be up next weekend. Its usually freezing cold but we have never been up without catching a few. Last year we were up there in during an ice storm. We caught 17 that day. 12 stocked and 5 up in the park. 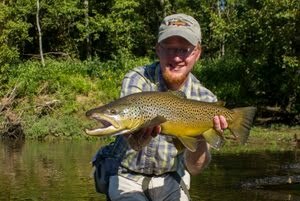 I caught a nice 13" brown, my first and only brown. We are complete novices to trout fishing. We fly fish occasionally but usually use a spinning rod. We are coming up next weekend and I am concerned because it has been so cold. Your blog post gave me a little hope. Can you reccomend any flies that might work out in the park this time of year? Thanks. I enjoy the blog. Savez, thank you for stopping by. 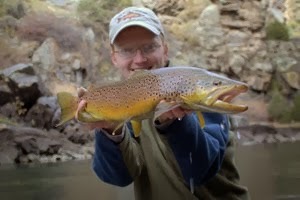 A 13 inch brown is a great fish in the Park so it sounds like you already have some good ideas! The cold weather is definitely a challenge but it is also one of the better times to target the larger browns. The fish still have to eat of course and will take a variety of streamers and nymphs. I would recommend streamers such as Clouser Minnows, Bellyache Minnows, Zonkers, and any type of crawdad or sculpin pattern. Little River Outfitters sells a pattern called a Super Bugger that has big dumbbell eyes that is awesome. The streamer, crawdad, and sculpin patterns should either be fished weighted or with enough split shot to get them down. You can fish a lot of these patterns on spinning rods and I have been known to fish that way on occasion. Whatever you fish them on, don't use too light of line. I stick to a minimum of 8 pound test on a spinning rod and a minimum of 3x tippet on the fly rod (prefer 1x or 2x tippet). 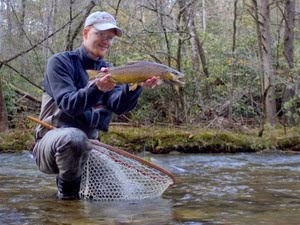 When it is extremely cold and the water is high, it is a lot safer than wading around with the fly rod. 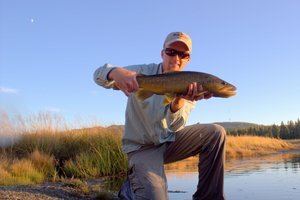 If you want to use the fly rod, stick to nymphing deep with lots of weight to keep the flies down. 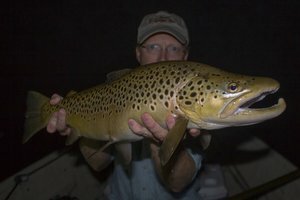 Focus on soft water and try some larger stoneflies (#6-#10), Pheasant Tail nymphs (#12-#16), and then some small midge or Blue-winged Olive nymph patterns (#18-#20). I like a tandem rig. Fish the big fly with the little fly dropped off the bend 18" or so. Oh, and when it is cold, slow is generally best with the streamers but vary your retrieve until you figure out what the fish want.